Why Should the Current Japanese Constitution be Amended? Is there any other constitution as abnormal as this? The current Japanese constitution was written with malice and vengeance by the occupying force in the aftermath of World War II in a way that denied the Japanese history, cultures and traditions almost completely so that Japan could never rise again from the ashes of the war. Nobody at the GHQ (General Headquarters) of the occupying force would have imagined that the constitution based on a shoddy draft written in a mere week would last without any amendment for so long. The　following　is　an　edited　transcript　of　a symposium　organized　by the Japan　Institute　for　National　Fundamentals (JINF) . Sakurai: The situation surrounding Japan is undergoing tectonic changes. How should we deal with these drastic changes? Other countries are making efforts to cope with the changes they face in their own ways and are taking concrete steps. However, Japan alone has been stuck in a helpless situation. Although there are various problems, we believe the constitution is at the heart of problems related to everything, including institutional systems, laws, ordinances, cabinet orders and values. Unless we tackle the root cause of the problems, Japan is unlikely to rise again. First of all, let me ask Mr. Takubo to deliver a keynote address with that point in mind. Takubo: We need to make constitutional amendment now because the constitution that we Japanese have upheld in the postwar period and the systems based on it have been crumbling, in the eyes of both ourselves and other countries, so there is no time to waste. There are domestic and international factors that make it urgent to amend the constitution. The domestic factor is the Great East Japan Earthquake and the ensuing Fukushima nuclear accident. The Japanese constitution does not provide for crises like this, as it is an occupation-era constitution. In short, there is not any provision that specifies what should be done if a major natural disaster strikes Japan or if a foreign country attacks it. Because of the absence of a provision that temporarily gives strong powers to the prime minister or suspend private rights in times of crisis, the government’s response to the earthquake disaster was quite poor, as it remained unclear who was responsible for what. The disaster has apparently exposed the greatest defect of the constitution Japan has upheld in the postwar period. Even if the constitution is immediately amended to include an emergency provision that enables adequate response to such a crisis, it is doubtful whether Japan can quickly adapt to this change. Five or so reports which have so far been issued with regard to the nuclear accident suggested that the poor disaster response may be mostly attributable to a human factor, namely the ineptitude of Prime Minister Kan. In short, constitutional amendment would be meaningless unless politicians in responsible positions have necessary qualities. The opposition Liberal Democratic Party (LDP) is also much to blame. It was Prime Minister Nobusuke Kishi who made serious efforts to amend the constitution. However, the sight of Mr. Kishi struggling with the social and political turmoil of 1960 (which was triggered by the protest against the revision of the Japan-U.S. Security Treaty) apparently led other politicians to believe that addressing such issues as constitutional amendment and national security would not serve their own interests although it would be good for the country. Since then, politicians have avoided discussing military and constitutional issues in public. A lack of necessary qualities on the part of politicians is also a major cause of the current woeful situation. As for the international factor, the preamble of the constitution is the problem. The whole of the preamble lacks emotional appeal and is meaningless. Particularly outrageous is this sentence: “we have determined to preserve our security and existence, trusting in the justice and faith of the peace-loving peoples of the world. For example, substitute “peace-loving peoples of Russia, North Korea and China” for the “peace-loving peoples of the world.” Have we entrusted Japan’s security and existence to such countries? The preamble states that we “have determined” to do so. This sentence alone would make sensible people feel ashamed to argue that the constitution should be kept unchanged. Since the era of the Ikeda cabinet (in the first half of the 1960s), Japan has devoted itself to the goal of becoming a major economic power while keeping its military capabilities to a minimum. It has not made efforts to strengthen its military power. Fundamentally, the Self-Defense Forces (SDF) do not have the formal status as a national military force. Therefore, to the domestic audience, the government has been reiterating its official line that the SDF is not a military force. On the international arena, the government would like to repeat the same line but refrains from doing so because if it denies that the SDF is a military force, SDF personnel may lose the protection of international law as they would be treated as guerrillas. Therefore, the government has said different things for domestic and foreign audiences. Is there any other country doing such a shameful thing? Japan’s diplomacy is malfunctioning. When an international incident that threatens Japan’s national interests occurs and opposition parties demand clarification from the government about its stance, the standard initial answer is “We will do fact-checking.” After fact-checking is done, the government typically expresses its intention to protest to the offending country. Finally, the government has nothing to do but to turn to the United States for help, asking for the application of the Japan-U.S. Security Alliance. That process has been repeated over and over again. This is nothing but the malfunctioning of Japan’s diplomacy. As a solution, by far the best thing to do is amending the existing constitution or creating an entirely new one. We should start by revising the preamble, which is too nondescript and matter-of-fact. In the Meiji Era (that began with the radical reform of the three-centuries-old political system of the Tokugawa Shogunate), Japan actively absorbed European cultures, and thereafter, it continued to introduce foreign cultures, mainly from Europe and the United States. Japan’s identity is represented by what is known as kokutai. Kokutai, a word with which younger generations are not familiar, refers to national heritage. Japan’s national heritage is encapsulated in the dynasty of the Imperial Household. European kings and Chinese emperors reigned as conquerors. However, the Japanese Imperial Household has lasted until now on the basis of authority rather than power (the era of Emperor Godaigo is an exception). In the Meiji Era, the Emperor was invested with power, but this arrangement was necessary for Japan to become a modern country, so Emperor Meiji should not be seen in the same light as Emperor Godaigo. With two millennia of history behind it, the Imperial Household is something that we can uphold proudly to the world. Thanks to this heritage, Japan has maintained unity based on the fine balance between authority, power and people. The Japanese people have pursued peace and loved nature based on the national heritage centering on the Imperial Household. The network of human connections underpinned by bonds between various people, including blood relations, friends and co-workers has fostered Japan’s national heritage. A constitutional preamble that includes references to these things would be something that we can proudly uphold to the world. To that end, we should first revise the provision of Article 96 of the constitution that requires a two-thirds majority in both the House of Representatives and the House of Councillors for the initiation of constitutional amendment so that amendment can be put to a referendum according to the standard rule of democracy, namely if a one-half majority support is obtained in the Diet (the Japanese parliament). This should be the ground rule for debate between pro- and anti-amendment forces. Sakurai: Mr. Takubo had harsh words for the opposition LDP as well as for the ruling Democratic Party of Japan (DPJ). Now, let us listen to what Mr. Hori has to say about why constitutional amendment is necessary now and what the key points are. Mr. Hori was involved in the drafting of the LDP’s proposals for constitutional amendment. Hori: April 28 of this year marked the 60th anniversary of the effectuation of the San Francisco Peace Treaty. Over a period of around two years until the anniversary day, we held 57 meetings and announced a draft new constitution on April 28. Constitutional amendment is an objective the LDP has pursued as a party policy since its foundation in 1955. Therefore, the LDP has been devoting serious efforts to the study on constitutional amendment. For example, in 2005, we drew up a draft new constitution and announced it at a party convention, and the LDP’s General Council approved it. We could not ignore it. Using it as a basis, we started drawing up a new draft constitution by taking account of various issues that have now emerged. I also regard the preamble as very humiliating. The part “we have determined to preserve our security and existence, trusting in the justice and faith of the peace-loving peoples of the world” appears to indicate a complete lack of independence. It is important to revise that part at the least. “The Emperor shall be the symbol of the State and of the unity of the People” is a phrase that sounds pleasant to the ear, but it is doubtful whether this sentence has any substance. I have heard of an episode of conversation in which an elementary school pupil asked a teacher what the symbol of the unity of the people means. The teacher replied that it means something like ”okazari” (decoration piece). Although I haven’t checked whether the story is true, it seems to be a plausible episode. The Emperor has been given the status of the head of state so that he can perform state functions, such as formally accepting foreign envoys, in that capacity. The so-called peace provision of Article 9 may be kept as it is. However, a nation has a natural right to self-defense, just as an individual person has a natural right to self-defense. When a person is attacked, he or she has the right to counterattack as a defensive measure without the fear of being charged with a crime. We also included an emergency provision, which takes up an entire chapter, so our draft constitution has one more chapter than the current constitution. This specifies not only how to respond to natural disasters but also how to resolve international disputes. Even without such a constitutional provision, it would be possible to deal with international disputes by invoking an emergency law. However, our draft constitution makes references to how to deal with international disputes because we believe that the people’s awareness about national security will grow if the constitution has an explicit emergency provision. Article 96 contains a provision for constitutional amendment, which sets a very high threshold by requiring a two-thirds majority support. If we are to put the LDP’s amendment proposal to a national referendum, we need to obtain a two-thirds majority support in both chambers of the Diet, the House of Representatives and the House of Councillors. That would be very difficult. To amend the provision concerning constitutional amendment first, we conducted various debates and reached a consensus that the parliamentary threshold should be lowered to a one-half majority support. However, our proposal to lower the threshold would need to be approved with a two-thirds majority in both chambers of the Diet before being put to a referendum. That’s very challenging. We need to amend at least Article 96 by persuading the DPJ to join hands with us. I would like you to understand that in addition to the issue of what should be amended, there are very difficult procedural hurdles. Sakurai: I know that the DPJ has not come up with a draft of its own, but Mr. Kitagami, you spent your childhood in the United States, so I presume that you can look at Japan not only as an insider but also from the viewpoint of an outsider. Could you offer your comments with that in mind? Kitagami: I would like to talk about four points. First, it is quite natural to amend the current constitution. This is obviously an occupation-era constitution, as it was established while Japan was under the U.S. occupation, an extraordinary situation. Now that the occupation has long been ended and Japan has become an independent country, it is quite natural that the Japanese people amend the constitution for themselves. The constitution is the supreme law that supersedes all other laws and regulations, so it is extremely important that a new constitution be established based on a national debate. Second, while constitutional amendment is important, the most important thing is that the Japanese people share the sense of identity as a nation. It is important to hold national debate on ideals as to what kind of country Japan should be and what role Japan should play on the global stage. After World War II, Japan pursued economic growth and succeeded in achieving it. However, while economic growth brought affluence, we Japanese failed to give due consideration to such matters as the constitution, nationhood, national values, history and tradition. Since the era of Prince Shotoku (who played the leading role in establishing a united government in Japan around the beginning of the seventh century), Japan has made it a national policy to deal with any great foreign power on an equal footing. Japan should maintain its position as a great nation, but I have the impression that our country is slipping from that position. When we live abroad, we have strong awareness about nationhood. From my own experience, I feel that Japan is a very divided country when it comes to national identity although there is a consensus on some points. It is difficult to answer the question “What kind of country is Japan?” Put another way, if someone offers his or her own idea of Japan’s identity, an objection is certain to be raised. It is not scientifically or logically possible to strictly define Japan’s identity as a nation. However, we are talking about ideals, which do not necessarily match the reality. Such is the nature of ideals. Even if ideals are disconnected with the reality, we do not necessarily have to deny them. For example, most Americans speak of “the American dream.” But the reality is that America faces problems such as racial and religious discrimination, economic inequality and elitism. Although the “American dream” is upheld as an ideal, it is doubtful whether everyone can fulfill his or her dream. Nevertheless, for Americans, it is important to share the “American dream,” upholding the ideal of making America a country where all people can fulfill their dream. Third, there is the issue of which system of government Japan needs. In this tumultuous world, we have to deal with various foreign countries, particularly China, so the government must exert strong leadership. It is uncertain whether the current system of government is up to that challenge. The Japanese constitution was written by Americans familiar with the U.S. presidential system. From the Japanese side, people knowledgeable about the Meiji system of government participated in the drafting of the constitution. Neither side was familiar with the parliamentary system of government that is supposed to be prescribed by the current constitution. Therefore, the Japanese system of government has elements of the division of the three branches of government that constitutes the foundation of the American system. In the United States, both the president and lawmakers are directly elected by the people, and the government and the Congress are on an equal footing. Even if the president tries to enact a budget, enactment is impossible without Congressional approval. That is a problem similar to the state of divided parliament that we see in Japan. However, under the parliamentary system of government in the proper sense of the words, a political party that has won a majority of the parliamentary seats elects the prime minister, who forms a cabinet. The prime minister is simultaneously the head of government and the leader of the largest party in the parliament. Therefore, bills and budgets written by the government should naturally pass through the parliament because the governing party usually has a parliamentary majority. But the Japanese system contains elements of the American-style division of the three branches of government, as shown by the characterization of the Diet (parliament) as “the highest organ of state power” in Article 41 of the constitution, and this makes it difficult for the government to exert strong leadership. In the United Kingdom, bills introduced by the cabinet are all but sure to be passed through the parliament. That is how the parliamentary system of government should work. The Japanese system should also be reformed through constitutional amendment so as to concentrate powers. Another key issue is the relationship between the national and local governments. Some people are loudly demanding the devolution of powers to local governments without considering the question of what the national government powers are. That approach is preventing the national government from making important decisions. That is true with the Okinawa issue (controversy over the relocation of U.S. military facilities and troops). Such paralysis also occurred in Osaka when the issue of whether to restart the closed nuclear reactors emerged. The national government has faced difficulty in making decisions on matters of national importance such as national defense and security as well as energy policy, as it has to accommodate the wishes of local governments. This is an abnormal state of government. Before devolving powers, it is essential to clarify what powers the national government holds under the constitution. Fourth, regarding national security, the current constitution virtually denies nationhood by stipulating that “the right of belligerency of the state will not be recognized.” As a rule of thumb, “belligerency” includes all military actions for the purpose of both self-defense and invasion. Therefore, the constitution, if interpreted straightforwardly, means that Japan should sit on its hands even if attacked by an enemy nation. In the postwar period, Japan has obfuscated on that point all along. That paragraph should be deleted and Japan’s right to self-defense, and also collective self-defense, should be explicitly prescribed. When I was an opposition politician, I was a member of an investigative committee on constitutional issues and stated in the Diet that the constitution should be rewritten in proper Japanese even if its substances are to be left intact. Of course, the substances should also be changed, but my point was that our country would decline sooner or later if it continued to uphold a constitution so badly translated from a foreign language that legal interpretation requires examination of the original text. Sakurai: The three people who spoke now seem to share the view that the current constitution utterly fails to perform its function as Japan’s supreme law – representing the Japanese people’s values. Why was such a terrible constitution written? What are the important points that we should bear in mind? I would like to ask Mr. Osamu Nishi, a professor emeritus at Komazawa University, to discuss those matters. Nishi: It was on August 29, 1945, immediately after the war, that the basic American policy toward Japan emerged in concrete form. The U.S. government issued an order to MacArthur, stating that the ultimate objective of the occupation was to ensure that Japan would never again pose threat to the peace of the United States and the world. This remained the basic occupation policy for a long time, so that order was the basis of everything, including the constitution as well as education and religious policies. We must bear in mind that the constitution was written on that premise. As for the constitutional preamble, which was discussed earlier, Alfred Rodman Hussey, commander of the U.S. Navy, wrote it by piecing together snippets from the Declaration of Independence, the American constitution, Lincoln’s Gettysburg address, the Teheran Declaration and the Atlantic Charter. Therefore, it is no wonder that the preamble lacks references to the Japanese heritage, tradition, culture and history. Given that the current constitution was written by Americans in line with the occupation policy within the framework of the American way of thinking, it is natural that the Japanese people should write their own constitution. Although the Japanese postwar constitution is referred to as a “new constitution,” it is the fourteenth oldest constitution in the world. The American constitution, which is the oldest, has undergone a fairly large number of amendments since its establishment in 1787. Germany’s constitution, known as the Basic Law, has been amended more than 50 times since its establishment in 1949, while the French constitution underwent more than 20 amendments. The Japanese constitution is the only constitution in the world that has not been amended for more than 60 years. That is quite unusual, extraordinary and abnormal. Sakurai: Preventing Japan from posing threat again to the world and the United States ― in other words, preventing Japan from rising again ― was the U.S. government’s objective. Japan should have discarded the constitution immediately after it became independent following the end of the U.S. occupation. Why was Japan unable to do so? We should consider that question again. Mr. Hori, could you offer your thoughts on that point? 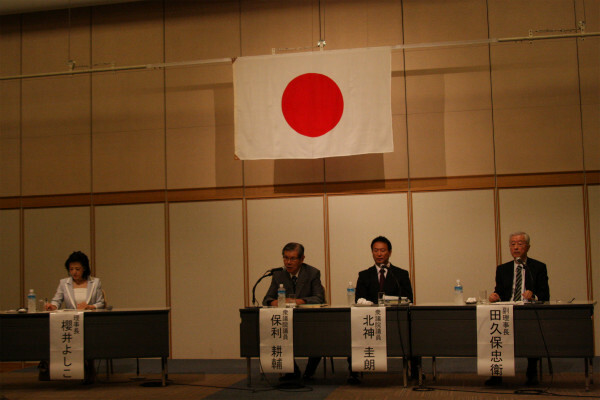 Hori: Why was Japan unable to pursue constitutional amendment? I suppose that you are suggesting that the LDP has failed to do its part. But when I look at Japan’s postwar history, it seems to me that the Japanese people have had a sense that Japan has become a successful country without amending the constitution by vigorously pursuing economic development. Sakurai: In the postwar period, Japan has become economically affluent, but there is a sense that the affluence is causing our decline as a nation. I think that constitutional amendment is attracting attention now because the people have recognized that. Of course, the March 11 disaster (the Great East Japan Earthquake, tsunami and the Fukushima nuclear accident) is also a factor. I would say the greatest reason why the constitution should be amended is that it does not reflect the soul of the Japanese people. In that sense, amendment of the preamble is very important. The preamble should include references to the Emperor’s position as the head of state as well as the Japanese culture, civilization and history starting from the era of myth. All these should constitute the pillar of the preamble. Could you discuss what values should be mentioned in the preamble? Hori: Let me quote the preamble of our party’s draft constitution. That part describes Japan’s basic structure as a nation. “Japan has achieved development by overcoming the ruin inflicted by World War II and numerous major disasters and has come to occupy an important position in the international community. Based on the ideal of pacifism, Japan is contributing to world peace and prosperity by promoting friendship with other countries. The Japanese people defend their fatherland with pride and determination and they respect the basic human rights. At the same time, they value unity and form a nation based on society-wide mutual support. We have high regard for freedom and discipline and seek to achieve national growth through vigorous economic activities by promoting education as well as science and technology while preserving our beautiful land and natural environment. That is the preamble of our draft constitution. It is shorter than the preamble of the current constitution. I believe it includes references to all essential elements of our nation. Sakurai: The LDP’s draft should desirably use a bit more graceful language, I would say. The Imperial Household, as represented by the Emperor, has been praying for the welfare of the people while nurturing harmonious relationship with them. Based on the people’s respect and adoration for the Emperor, the Japanese people have stayed united. That is the essence of Japan’s national heritage, I believe. That is directly expressed in the Charter Oath (Imperial Oath of Five Articles) of Emperor Meiji. The Emperor takes care of the people while people respect the Imperial Household. That is the spirit which has lived on ever since the era of Prince Shotoku. I think it is important to include clear, substantial references to that spirit in the preamble. Mr. Kitagami, could you tell us what elements you think the preamble should include? Kitagami: To my mind, the current preamble lacks references to the national heritage. In this respect, it is important that a national consensus be formed through a nationwide debate. Let me offer some personal thoughts. First, regarding the conduct of political affairs in Japan, the oldest existing imperial edict, which was issued by Emperor Monmu, states that political affairs should be conducted with “a clear, pure, and straightforward and conscientious mind.” The values treasured by Japan like these should be included in the preamble. Second, it should naturally be mentioned that the Imperial Household as represented by the Emperor is at the heart of Japan as a nation, as is indicated in the LDP’s draft that was cited earlier. The third element is the Charter Oath that Ms.Sakurai mentioned earlier. (Former Prime Minister) Shigeru Yoshida said at a plenary session of the House of Representatives in the aftermath of the war that the Charter Oath represents Japan’s national policy. I quite agree with that view. The Charter Oath was established on the occasion of the Meiji Restoration. In his radio broadcast announcing the defeat of Japan, Emperor Showa took the trouble of quoting this oath. That was, I believe, a confirmation that the national policy as represented by the oath would be maintained despite Japan’s defeat in the war. The Charter Oath is a statement of admirable principles, such as “Deliberative assemblies shall be established on an extensive scale, and all governmental matters shall be determined by public discussion,” “All classes, high and low, shall unite to carry out vigorously the plan of government” and “All classes shall be permitted to fulfill their just aspirations so that there will be no discontent.” The principle “Knowledge shall be sought throughout the world in order to promote the welfare of the empire” reflects a very cosmopolitan perspective. It would not be possible to include the Charter Oath in its original form in the preamble, but it would be a good idea to include the principles stated by the oath as translated into a graceful modern language. Sakurai: As you can see from the panelists’ comments, the Japanese ways of making decisions and conducting political affairs used to be really democratic. The principle “Deliberative assemblies shall be established on an extensive scale, and all governmental matters shall be determined by public discussion” represents the essence of democracy. The Charter Oath was announced in March of the year that the Meiji Restoration started. This made clear what kind of country Japan should be. The oath was announced by Emperor Meiji himself immediately after the decision was taken to make Japan a modern nation at the beginning of the Meiji Restoration. The origin of the Charter Oath can be traced back to the Seventeen-Article constitution that was established by Prince Shotoku. Since the establishment of the Seventeen-Article constitution in the seventh century, Japan has consistently preserved the same values. We must realize that this was a democratic constitution that gave consideration to the welfare of the people to an amazing degree by international standards. Mr. Takubo, could you comment on that point? Takubo: In addition to the length and contents of the preamble, there is another important issue of who should write it. It should not be written in bureaucratic language. It should be written by a virtuoso writer or someone with philosophical insight. So far, there have been three missed opportunities for amending the constitution. The first opportunity came when Japan became independent under the San Francisco Peace Treaty. Japan should have discarded the occupation-era constitution at that time. But there is room for excuse for missing that opportunity given that Japan was a poor country devoting itself whole-heartedly to economic recovery in the early 1950s. The third opportunity came after the Gulf War in 1990-1991. After the war, the Kuwaiti king posted in the Washington Post a full-page “thank you ad” listing 30 benefactor countries, among which Japan was not included. While other countries worked with blood and sweat to liberate Kuwait, Japan merely made financial contributions. Japan initially provided US$3 billion, but increased the amount to US$13 billion after facing a chorus of criticism. Even so, Japan’s contribution was not acknowledged by the international community, and that must have reminded the Japanese people of the humiliating situation in which their country was placed and have led them to recognize the need to do something with the constitution. Traditionally, Japan has looked at the international situation from a narrow-minded perspective. That attitude has not changed since before the pre-war period. Now, the fourth opportunity is before us. The Great East Japan Earthquake has devastated Japan and the Chinese military threat is looming large before us. If Japan does not want to provoke China, we may just move toward constitutional amendment quietly. No country has the right to complain if Japan shows its resolve to quietly become a normal country again. Sakurai: Asian countries are confronted with the Chinese threat in the territorial disputes in the South China Sea. When we visit countries located around the South China Sea or the Indian Ocean, we receive, amazingly frequently, requests for Japan to make its military intentions clearer, not for the purpose of attacking any particular company but in order to enhance deterrence. Under the current constitution, Japan has lost much in terms of honor and status as well as material welfare. If Japan continues to sit on its hands, it is certain to decline. Could you discuss this most critical problem? Hori: In that respect, our party’s draft includes an amendment proposal in Chapter 2, which concerns national security. While we retained the pacifist clause, we added a sentence noting that “the previous clause does not preclude the invocation of the right to self-defense.” “The previous clause” refers to the renunciation of war. In relation to that, we included references to a national defense force. “We possess a national defense force with the prime minister as the commander-in-chief in order to ensure the peace and independence of our country and the security of the nation and the people. The national defense force, when executing the mission prescribed in the previous clause, shall be subject to the control of the Diet through approval and other processes as prescribed by relevant laws.” Our draft is more elaborate in that respect than the current constitution. If we are to successfully amend the constitution, a national campaign will be essential. Even now, some people are insisting that their children should never be sent to the battlefield. It is natural that the people do not want to send their children to the battlefield. Nobody wants to do so. However, it is necessary to raise public awareness that we should have a resolve to do so if necessary. Sakurai: The Japanese people have nowhere to go other than Japan. There are many English-speaking countries and Christian civilization-based countries. But Japan is the only country centering on the Japanese civilization. We have no other country to flee to in a national crisis. If we are to defend our fatherland with its unique civilization, I would say we need to have a much stronger resolve and work much harder to do so than people in Christian civilization-based countries and Islamic civilization-based countries. If we are to defend our beautiful country with its long history, we must start by tackling constitutional issues. Mr. Kitagami, what is your opinion in that respect? Kitagami: Of course, the right to collective defense and the Japan-U.S. alliance are very important issues, but unless we have a resolve to defend our country on our own, the alliance would be almost meaningless and we would lose an independent mind. Sakurai: Today’s panel discussion focused on why constitutional amendment is necessary now and what values should be mentioned in the preamble of the constitution, for example. We chose this theme for the monthly seminar because we strongly hope to realize the amendment of Article 96 by taking it up as an urgent task. This year, I have accepted an offer to chair a private-sector committee on constitutional issues. Constitutional amendment involves various issues of debate. Addressing all of them at once is impossible. The committee’s approach is to form a consensus on the need for constitutional amendment and have Article 96 amended as the first step in order to lower the parliamentary threshold for amendment to a one-half majority support from the current two-thirds majority support. To that end, it is necessary to obtain the support of two-thirds of all Diet members, and we must seek to reflect the will of the people in the process. Therefore, I would like to ask all of you to communicate the need for constitutional amendment to as many people as possible and increase supporters. It is important to let the world see that Japan is trying to do something with its horrible constitution. After many decades of torpor, the Japanese people are waking up and striving to regain themselves. I believe letting the world recognize that effort will help to gradually reduce the threat posed to Japan and will provide the most effective deterrence. I know of no other country as wonderful as Japan. To defend and preserve our country for future generations, let us work together to achieve constitutional amendment as early as possible.